First and foremost I would like to praise the author(s) of the website for doing a hell of a job on the website(though still largely in Polish).. I especially like the thorough description of each and every opposing faction. This leads me to my query: The pages dealing with Ottoman Deli and Silahdars mention that the cavalry units used the very same hollow "kopia" lances as the Polish and (Serbo)Hungarian hussars... The pages about Sipahis (Sipahowie lenni) also discusses the differences betwen Rumelian and Anatolian units.. the former being much more closer to our Hussars..
Is there mayhap a study/book/source done on the subject in Polish or English language or in fact is there any material on the topic of Ottoman cavalry pole-arms during the classical period whatsoever? I do not know any book which is specific study on turkish lances. We were basing mostly on Osprey books and Halil Inalcik The Ottoman Empire: the classical age 1300-1600. I didnt read the later but AFAIK our historical consultant - Marcin Gawęda did. I'll see him this weekend at Niepołomice near Kraków. There will be historical gaming convention - Pola Chwały - so I can ask him about it. Which shows a kopia similar to polish - quite long, with a ball shaped guard and long pennon with two tails. So it is hard to tell what kind of lance was used by particular formation. What is worse it appears that in polish sources sometimes term "dzida turska" - (turkish lance) means koncerz sword (estopc). There is one source which clearly says "koncerz abo dzida turska" - "estoc or (in meaning: also known as) turkish lance". 2. Western tradition - charging with lance coughed under arm similar to Byzantine or 13/14th century knights. After charge most of them would break and remaining have to be discarded because they'll be to long for close combat. So in game we make two different sipahis types - western - from Rumelia - which have longer -about 3,5 m lances and charge with them western style, and eastern - Anatolian - which have shorter lances and fight with them eastern style (like with rohatyna). I'm familiar with that iconography.. another source for Deli would be Nicolas de Nicolay's: Dans l'empire de Soliman le Magnifique (which iirc come into several verions) , Delis are also seen in various places of Süleymanname.. However the various European woodcuts (+blacknwhite drawings) as well as Ottoman miniatures are subject to great artistic traditions , often depicting idealistic or even imagined weaponry. I agree that Codex Vindobonensis 8626 is our best shot. Theres more of it here: http://www.turkishculture.org/dia/index.php?lang=en&page=list&page_no=200 (though first register at the main site http://www.turkishculture.org for free), images also have a partial (though somewhat garbled) description... also the images are smaller ,so use the zoom function of your browser.. Apologies for bumping this late into this thread ,but did you have any luck on the Pola Chwały event with Marcin Gawęda? I have brainstormed the issue of Ottoman lances/calvary pole-arms to some degree with Radek Sikora - who had in turn kindly pointed out some interesting sources to me. As you can see many of the above mentioned facts and observation goes pretty much with what Marcin had written on this page. It is in English and gives some information about Turkish military. According to author Ottoman kapikulu cavalry used lances (called mizrak which means spear), but judging from attached picture those were about 3m long (page 348, kapikulu sipahies description - pages 347-357). About delis (p379 and picture p. 374) he writes that they are using lance after the Hungarian fashion. Those Albanians could be delis as in delis description You can read that they were Albanians or Bosnians (I'm also thinking that those 2000 of Kara Mustafa Albanian guards were in fact delis...). Those short polearms mentioned in Relacja are propably jerids (javelins). The history... states that it was popular weapon among them and they were very skilled in using jerids. - Albanians, Bosnians and some other frontier cavalry used longer lances - kopie. Propably majority of those troops were in fact delis - some were guards of viziers an some of provincial governors. - From pictures, and texts of de Marsigli and Ricaut we can see that those were Hungarian style lances. 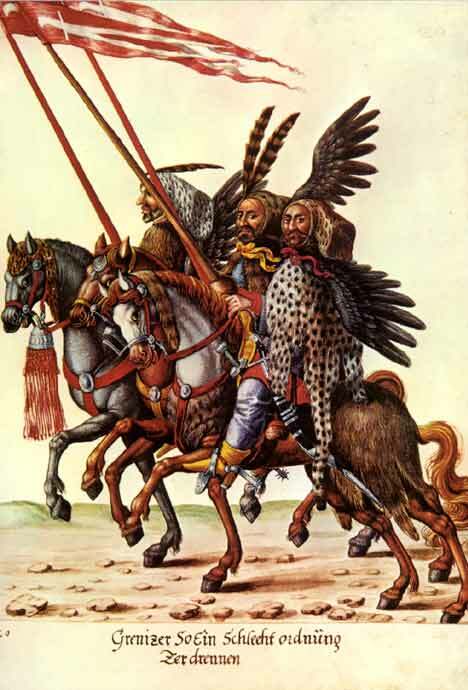 Similar to those used by polish hussars. I am familiar with the source - its an important one , more so as it is written in English imho..
(page 348, kapikulu sipahies description - pages 347-357). About delis (p379 and picture p. 374) he writes that they are using lance after the Hungarian fashion. Those Albanians could be delis as in delis description You can read that they were Albanians or Bosnians (I'm also thinking that those 2000 of Kara Mustafa Albanian guards were in fact delis...). Those short polearms mentioned in Relacja are propably jerids (javelins). The history... states that it was popular weapon among them and they were very skilled in using jerids. Well I think the mizrak lances could be used in several ways .. if you'll look at all the Central Asian/middle eastern paintings and miniatures in most of the cases the two handed "sarmatian" style predominated... but instances of a couched techniques are depicted sometimes as well.. there is a 14th century Mameluke manual describing various lance plays including overhand, under arm , the two handed as well as the "syrian" couched style as well.. I do think the Mizrak is a bit more versatile weapon while the Kopia is more specialized , yet at the same time Kopia could be considered more "powerful" due to its superior reach (+transfer of energy due to the couched style). Most interesting, didn't know Poles used jerids as well.. There is also a word rohatyna and włócznia. Włócznia is different name for rohatyna and in common Polish all spears are called włócznia. As Górski writes rohatyna was called włócznia because it was striped to cavalryman arm and dragged in this fashion. To drag in Polish is włóczyć and so włócznia is something which is dragged. Maybe in late middle ages/early renaissance there was some difference between rohatyna and spisa and so there were two different words. Some early rohatynas had hooks (to hook sbdy ) or bars (versions for hunting - bar was useful when hunting bear or boar). They were also not very long - about 2-2,5 m. Maybe spisa was used for spear without hook and longer - about 3 m or even longer (pikemen in Poland were called spiśnik which mean spisa-men). In XVII century rohatynas and cavalry spisas were almost the same (rohatynas were probably a bit shorter). And besides our ancestors simply used one or the other word as fit them best. I didn't said that. Poles just had a word or those weapons. I checked a dictionaries and Polish word dzida is derived from Turkish language. The same word is used for short spears used by Tatars and sometimes for koncerz sword (Radek mentioned once that he find text which states: koncerz abo dzida turska which means koncerz or Turkish dzida). I read very poor in Czech but I managed to understand a bit. As for calling delis Turkish hussars. Both units had the same ancestors so they were quite similar - the main difference was in polish hussars in 17th century were using armour and delis not. Agree. I've seen paintings of different uses and heard about this Mameluke manual but didn't have it so my knowledge is rather scattered. Thanks for clarification. Poles just had a word or those weapons. I checked a dictionaries and Polish word dzida is derived from Turkish language. The same word is used for short spears used by Tatars and sometimes for koncerz sword (Radek mentioned once that he find text which states: koncerz abo dzida turska which means koncerz or Turkish dzida).